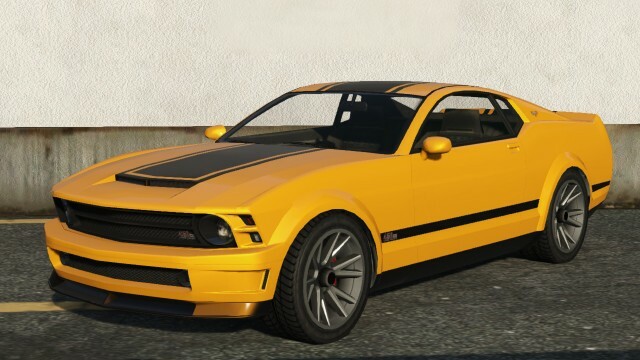 The Vapid Dominator is muscle car featured in GTA 5. The main body of the Dominator seems to be heavily inspired by the fifth generation Ford Mustang, with flared wheel arches, connected to the elevated area that spans the lower body. The front headlight pockets are taken from the fifth generation Mustang, with the circular headlights, squared grille and hood being skewed forwards and down. The rear hatch closely resembles a fastback design, also taken from the first generation Mustang. The front grille design, rear fascia and taillights and are derived straight from the 1970 Ford Mustang fastback. The rear lights are placed on an impressed area between the rear spoiler and rear bumper. The rear bumper features circular dual exhaust with chrome tips. Halfway up the body, the main body line makes a sharp angular turn, signaling the classical inspiration of the first generation Mustang. The Vapid Dominator features twelve spoke wheels, wrapped in low profile tires. The Vapid Dominator features a high torque V8 engine, which gives it fast acceleration and an above average top speed. However, due to its excessive torque levels, the car suffers from a common muscle car problem: the engine supplies too much torque for the transmission and wheels to handle, causing it to fishtail if the gas is applied when cornering. The Vapid Dominator also features a front engine, rear wheel drive layout. 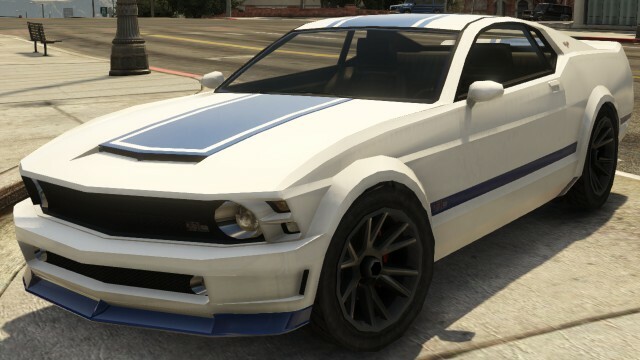 At the parking lot near the third Los Santos Customs, you can easily find this car. Spawns in the driveway opposite the house of Peter Dreyfuss in A Starlet in Vinewood. The Vapid Dominator Found in the Kortz Center parking lot during The Wrap Up. Occasionally found at Los Santos Customs parking lot in Burton. Starts to spawn commonly in Los Santos after completing The Wrap Up. Bumpers, Skirts, Bodywork, Exhaust, Hood, Grille, Turbo, Roof, Spoiler.